Wow, happy November you guys!! I am in shock that it’s actually November already. It just seemed like all of a sudden summer was over and mid-September was here, and now, WHOA…it’s November!! I’m both sad and SO excited. I am only sad because I wish I could slow this time of year down. The next 55 days from now until Christmas are my absolute favorite, and every year they seem to fly by faster and faster. UGH. I am so excited though because this holiday season I have SO many fun things planned. 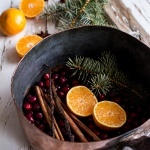 Think holiday recipes galore! I’ve actually tried to be somewhat organized, I’ve been thinking about the next two months since early September. Now I wish I could say that I have everything all planned, buttoned down and ready for you all to see, but I am not THAT good. I just have my ideas. Execution still needs to occur, so we shall see how much of my list I accomplish this year. It’s rather large, so I think I’ll be happy if I cross at least three-fourths of the list off. So how about you guys? Any holiday plans? Fun recipes you want to make, activities? Are you cooking Thanksgiving dinner? OH and um, how was everyone’s Halloween? It was kind of fun that it fell on a Saturday this year. Mine was pretty low-key, but I did get to see Asher in her little fox costume. I know I say this all the time, but she is the cutest. She LOVED every second of yesterday. Funny thing is that she doesn’t actually care all that much about the candy part. She just loves dressing up. I don’t know about you, but when I was a kid, I would grab a pillow and run house to house until it was just too heavy to carry. Between all five kids (Red doesn’t count cause he was just a tiny baby and Asher was not even born yet) my parents typically had Halloween candy around until Thanksgiving. Those Malley’s bars though? Oh my gosh, those were the best!! Only the big mansion-like houses gave them out, but it was like getting the golden ticket when you received one. Ahh, so fun! I kind wish I could relive those days just a little sometimes. Do you have any fun stories to share?? Tell me, tell me! But ahh, okay. Back to the point here! 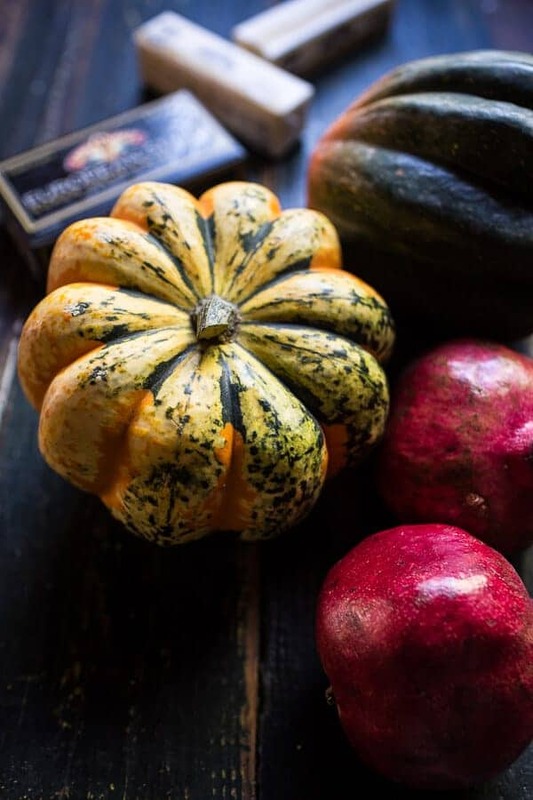 I could not think of a better way to kick off November – and pretty much the official start to the holiday season, than with this pretty brown sugar and pineapple roasted acorn squash . It’s easy, delicious and the perfect accompaniment to any holiday meal, whether it’s Thanksgiving, a fun dinner party or even Christmas! It is no secret that I love pineapple. I mean, I buy at least two a week. It is also no secret I love acorn squash, so naturally the two had to come together. When I was a kid my mom would make acorn squash with butter and brown sugar all the time, so really this is just a little fancied up version of my mom’s recipe. It is still SO easy though and the real secret to this recipe is LAND O LAKES® European Style Super Premium Salted Butter. It’s actually kind of my special ingredient in all my recipes these days, but especially this squash. When paired together with the brown sugar, pineapple and a little spice? Yeah, it’s perfection like no other. Trust me. But wait! You actually brown the butter to give it this nice warm and toasty flavor. I know, I know. YUM. So obviously this side dish NEEDS to be on all of your holiday tables. It’s a classic taken up a notch, with just a little twist and some really good butter. After all, I don’t really think you can properly do Thanksgiving without butter. Aside from the turkey, it’s kind of the star of the show. Really, think about it, you need butter for that pie crust, butter for those mashed potatoes, butter for the turkey, butter for gravy and those rolls? Yeah, they definitely need butter – see, totally the star. And lastly, I just have to mention how easy this is to prepare, basically the oven does all the work for you and the ingredients are simple ones you may even have on hand right now. YES! Simple is always good this time of year. It's easy, delicious and the perfect accompaniment to any holiday meal, whether it's Thanksgiving, a fun dinner party or even Christmas! Preheat the oven to 400 degrees F. Lightly grease a 9x13 inch baking dish with softened butter. 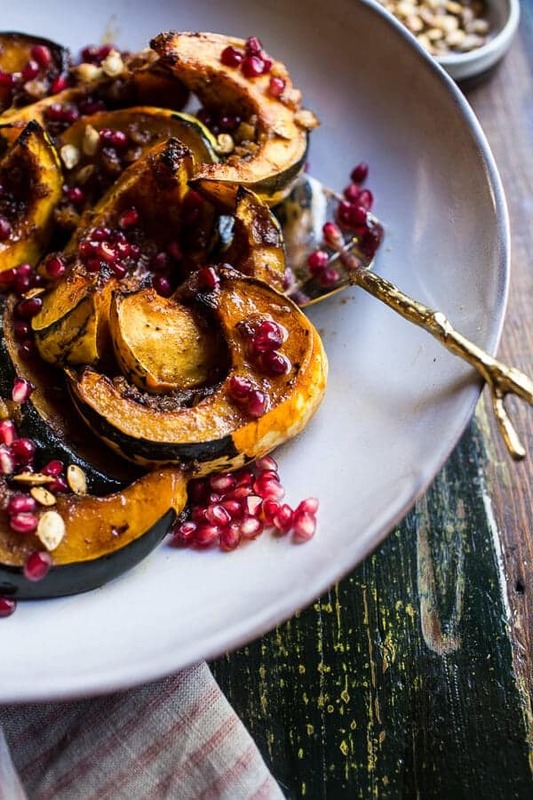 Halve both acorn squash, remove the seeds *but save them for roasting! Next cut the squash into wedges. Line the squash wedges up on the prepared pan. Evenly sprinkle the brown sugar over the the squash and then season with salt + pepper. Now spoon the crushed pineapple over the squash wedges, allowing some of the pineapple to fill the cavity of the squash wedges while the remaining pineapple gathers around the squash. Place the butter in a small saucepan set over medium heat until just browned. Butter will melt, foam and froth, then begin to brown along the bottom. Remove from the heat and whisk the browned bits of butter off the bottom of the pan. Whisk in the cinnamon, chili powder + pepper. 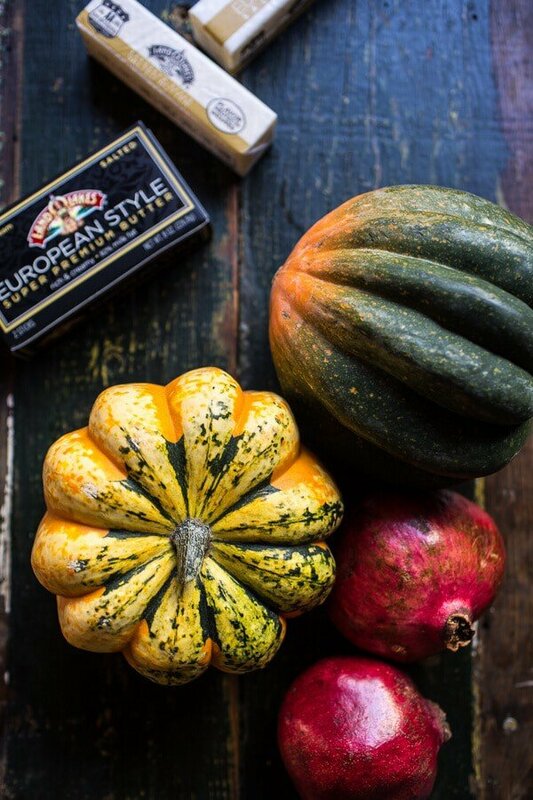 Pour the butter over the squash, using your hands to rub all over the squash. Cover the dish with foil and place in the oven. Roast for 30 minutes and then remove the foil and roast for another 30 minutes or until the squash is tender and caramelized. 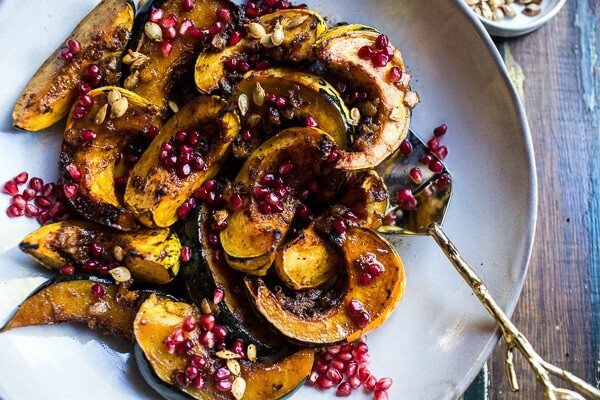 Sprinkle the squash with pomegranate arils and toasted acorn squash seeds (recipe below). Serve warm. To roast your reserved acorn squash seeds, rinse them off and pat them dry. Toss with 1 tablespoon olive, salt + pepper. Place in the oven at 400 degrees F and roast for 10 minutes or until golden brown and toasted. 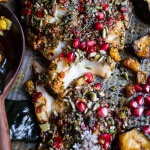 *Instead of slicing the squash into wedges, you can also leave the squash in halves. Follow the same directions as listed above. 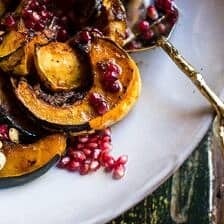 **The acorn squash can be roasted a day in advance and placed back in a 400 degree F oven for 10-15 minutes just before serving. This sounds delicious and perfect. I definitely will be adding this to my Christmas Eve dinner. (Sadly we don’t celebrate Thanksgiving in South Africa, weird hey! and I have no idea why.) Anyway, I have the family (hubby’s side) around every year, and I do all the cooking. I always like to do at least one or two different dishes each year, so this is it :-). Have a great week Tieghan. Oh awesome! This will be perfect for Christmas!! 🙂 Thank you so much and I hope the squash is a hit! 🙂 Merry (early) Christmas! Awe! That sounds like so much fun! Thanks so much, Linda! Have a great week! I am going to reread this later and consider making this soon. Awesome! Hope you love the squash! Thanks! 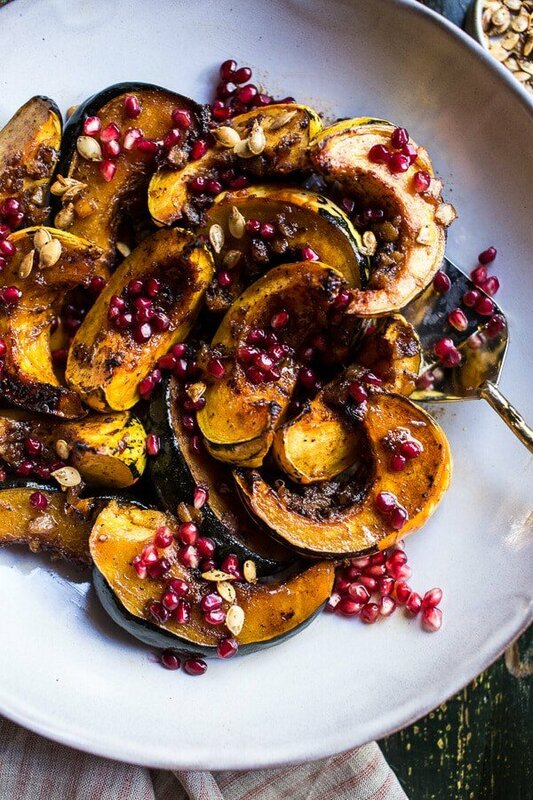 Squash is probably one of my top five fave ingredients to eat and cook with. This recipe sounds right perfect for my tastebuds, indeed!! Mine too! Thank you so much! Hope you had a fun Halloween! Yes to the pineapple! Loving and pinning this one to make! Thanks so much, Ramona! Hope you had a great weekend and a fun Halloween! 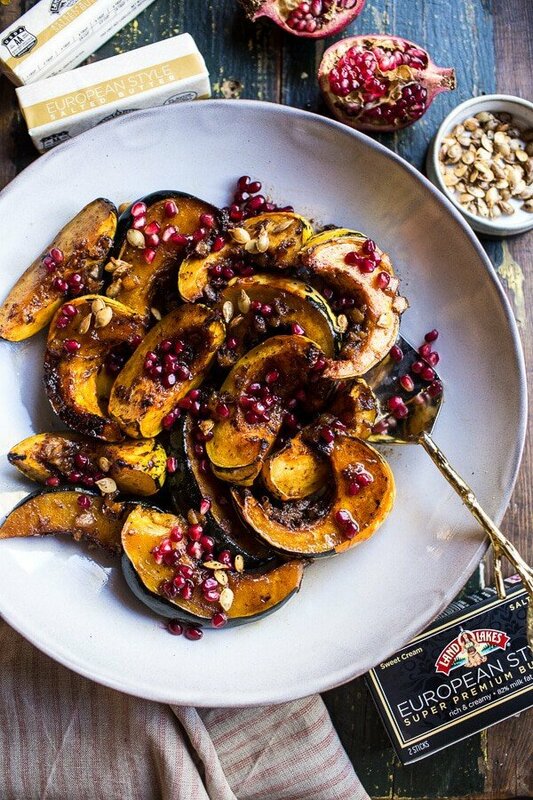 Roasted squash is the best, this is such pretty side for Thanksgiving! Agreed! Thanks so much, Laura! Hope you had a fun Halloween! Whoa! Almost done with Christmas shopping?!? Go you! I have not even thought about it! Thanks Natasha! Hope you had a great weekend! I love pineapple but never ever would have thought to pair it with squash, I will definitely have to try this! I just bought a bottle of white balsamic-pineapple vinegar I think maybe I’ll add a splash of it to your recipe! Oh yum! I bet that will be awesome! Thanks so much and I hope you had a great Halloween! 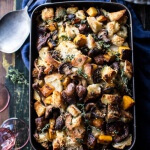 I love finding new recipes with squash it is perfect for fall and warm meals. I like the pineapple addition sounds great! 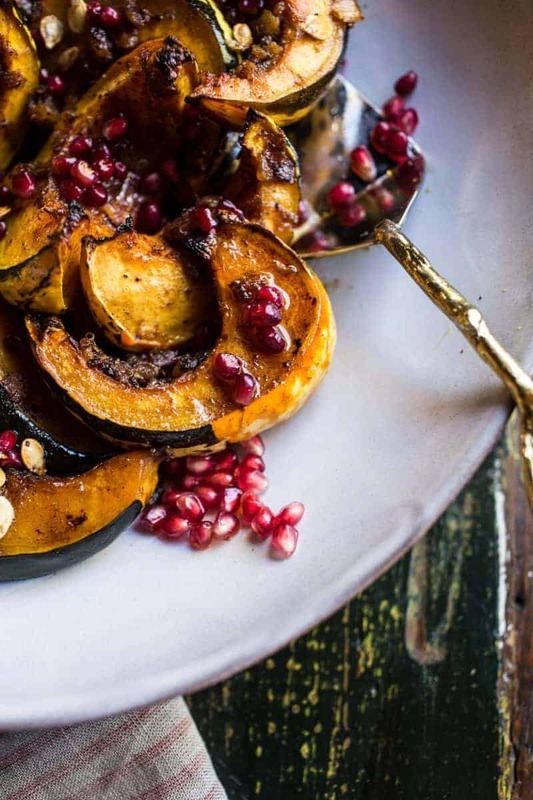 I love pomegranate, and we’ve grown too many squash this year – so this is perfect! Gorgeous and delicious! I can’t wait for the Thanksgiving to have food like this. Hi! I love your recipes! I want to make this for Thanksgiving tomorrow, but with yams. What adjustments would you suggest making? Thanks so much! And happy Thanksgiving! Hey!! That sounds awesome! I would slice the yams into 1/2 inch slices and probably keep the baking times around the same. Hope that helps and Happy Thanksgiving! This looks amazing! So pretty! 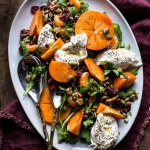 I eat slot of butternut squash but I haven’t cooked with the acorn squash. Do you need to peel it or can you eat the peeling? I can’t wait to make this for thanksgiving!!! And I LOVE pomegranate so much and it makes everything look so festive. Thank you for your recipes. You do the heavy lifting for all of us wannnabe chefs!! If I make this the day before, do I hold off on adding the pomegranate and seeds until after it is heated the next day? This sounds like a perfect side dish! Could I do this on a sheet pan because I will be doing 5 at least and still just cover it with foil on top? This sounds like a perfect side dish! Could I do this on a sheet pan as I will be doing several and cover it will foil on top?